Mark Zuckerberg sits right at the top of the professional totem pole. He leads a team of over 12,000 employees at Facebook, the company’s among the most valuable in the world, and he’s worth a cool $50 billion (Rs. 3,50,000 crore). All this before he’s celebrated his 33rd birthday. You’d think that such stupendous success would be built on some backbreaking work – long hours spent in office, late night meetings, and coding sessions powered by coffee and Redbull. But as Zuckerberg answered on a question on his Facebook, his schedule isn’t quite as intense. 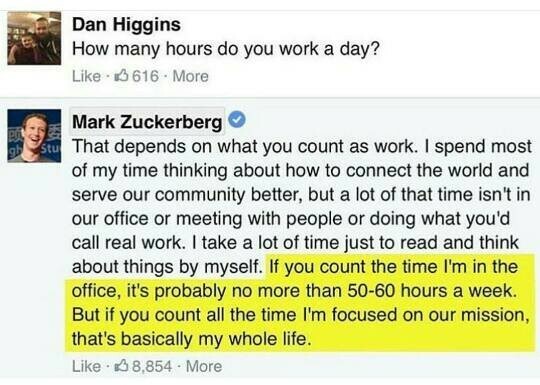 Zuckerberg works pretty much as long as you and me. He says he works between 50 and 60 hours a week. That’s 10-12 hours per day for a 5 day week. Zuckerberg says that while he isn’t in the Facebook office more than the average employee, he spends a lot of his time “thinking about how to connect the world” – which is also Facebook’s mission. He never disconnects from his goal – he’s constantly involved in trying to make Facebook more successful. Maybe that what makes Zuckerberg so much more effective than most people. Most people turn off their work lives when they’re home. Zuckerberg’s turned his work into his whole life. And once you can do that, you don’t need to spend long hours in the office to be successful.